I just got some time with Samsung's Android handset for Sprint, the Moment, and it looks promising, but barely differentiates itself from the Android crowd. The Moment is a fairly slick-looking device, quite thin for a full QWERTY slider and with an inoffensive black and silver design with a nice silver grille accent on the top. It's certainly a step up from the other major Android QWERTY slider around, the T-Mobile G1: For one, it's got a 3.5-mm headphone jack and SDHC expansion (compared to an awkward mini-USB combo and a microSDHC), but it's also significantly thinner and loses the G1's chin. The QWERTY keyboard feels okay—it's solid and nicely clicky, but the keys are a little flush for me, making it harder than I'd like to differentiate between keys. But the layout is easy to learn and it's overall very easy to use. The Moment also has an array of buttons around the side: A volume rocker on the left; 3.5mm headphone jack under a protective flap on the top; and a microUSB jack, speakerphone toggle and camera button on the right. It's got a 3.2MP camera on the back, which isn't as good as the Hero's and Cliq's 5MP lens. The front of the device houses the main buttons (Home, Menu, Back, Call and Call End, the latter two of which are tactile) as well as the optical trackpad, which I found a little confusing: It's harder to use than simply touching the screen, and I'm not really sure what exact purpose it's supposed to serve. To its credit, it's very responsive and has nice tactile feedback on the click, but I'd always rather touch the screen. 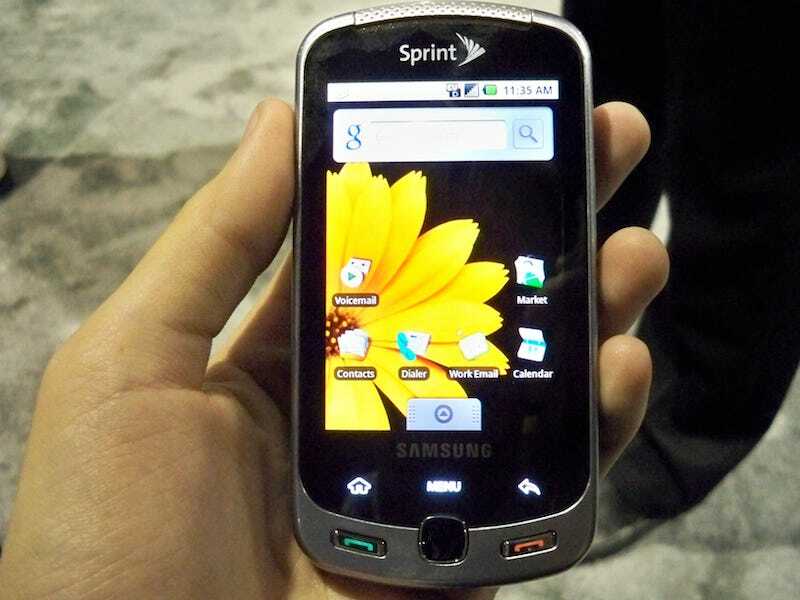 Unlike the Motorola Cliq or HTC Hero, Samsung hasn't messed with the stock Android interface very much at all, merely sprinkling in some carrier-specific widgets like Nascar, Sprint Navigation and Sprint TV, which actually works quite well. Compared to the Cliq, which is really the Moment's main competitor, I'd have to say I prefer the Cliq. The Moment's stock Android OS seems so last year, and even though the Cliq is sort of frenetic and sometimes cluttered, at least it has a philosophy. The Moment seems totally serviceable, but Android can be exciting—hell, Sprint even has one of the most exciting Android handsets already in its lineup, the HTC Hero. All in all, the Moment is a solid, if unremarkable, addition to the Android lineup.